So when I told you I didn't buy anything in Toronto I guess I forgot about this dress! How could I forget? 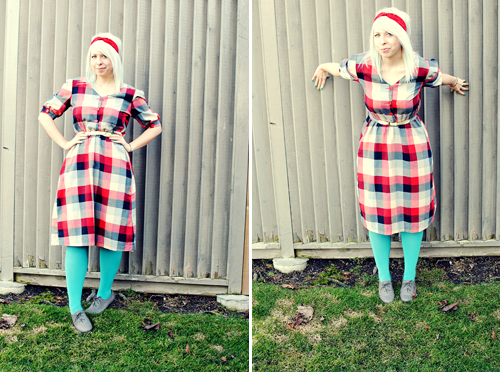 I love this dress and it was only $10 from Black Market in Toronto. I meant to take a photo of the back, it has really cute buttons near the shoulders. You can kind of see them in the second photo. Those shoes are becoming my "go-to" shoe. They go with so many things and they're comfy too! I wore this outfit on Saturday. We ended up getting lots of wedding stuff done which we were both really happy about. Then we popped by my dad's for a yummy dinner! My dad is awesome and he always cooks vegan for us. Actually, all of our parents are really good about cooking things we can eat! You look so colorful and cheery...not to mention beautiful! Love these colors together! B-e-a-utiful! I really love the colours of that dress. amazing, what a steal! and i love the color of the tights with it :) you're so cute always! Pefect for Spring. Love the color of those tights. Stunning dress! And what a great find at that price, too. $10!!!!! nice score lady! i love all the colors together...i have been meaning to email you about the clothes exchange thing...i will try and do that right now! I love your outfit! All of the bold colors look amazing together. It's inspiration like this that is causing me to re-think my wardrobe do's and don'ts. I need more $10 dresses in my life. That pattern is just amazing and it's so cute for a 10 dollar dress! I need to get myself a passport card and get to canada obviously! I adore your tights. Well the whole outfit really. But especially the tights! Super cute dress...and great shoes!! What a great price! You look awesome :) That's so cool your family makes you vegan food. When I was a vegetarian years ago...my extended family (aunt, uncles, cousins, etc) used to give me such a hard time. If we were visiting them for dinner I basically starved while they made fun of me. Having a supportive family is verrrry nice. Those are some super fantastic tights you have on! Two thumbs waaaaaay up. Btw, how often do you dye your hair? Shampoo? As you know, I've recently gone blonde myself and I'm having trouble keeping it from getting brassy. Any divine advice? I need you to show me how to do that thing with the head scarves. 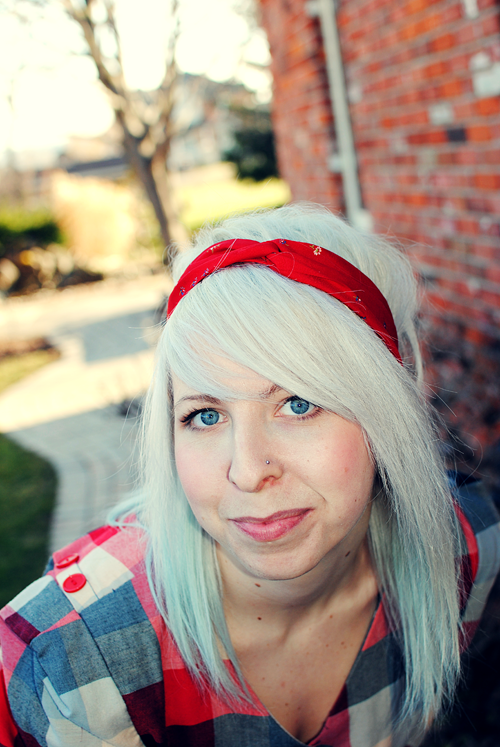 I am obsessed with wearing bandanas, headbands and scarves to jazz up my boring hair. I really like how that one looks! holy super cute fingernails batman! Oooh - cute! Love the dress + tights! Plaid dresses are my *favorite*!